Garry is 44 years old, married to Cherry and they have two sons aged 18 and 20. His stoma was formed four years ago due to diverticulitis. He recently became a volunteer for Colostomy UK. My symptoms had been going on for a couple of years and I was told that the pain was due to constipation. Then in 2013 my appendix was removed as it was inflamed and strangling the small bowel. Two months later I was told I had diverticular disease. I continued to be doubled up in pain. X–rays, MRI, CT and ultrasound scans didn’t identify the cause and in the end the surgeon decided to operate. When I went for my pre–op appointment I was told it would be a routine operation, carried out by keyhole surgery, and would last about three hours. They said I would have a temporary stoma. At the time I was OK with that, as I wanted to get back to normal. I went down to theatre on 30 July 2014. The next thing I remember is waking up on the ward and the surgeon telling me that there had been complications. They’d had to open me up because my large bowel had fused to my bladder. The operation had taken over nine hours and at one point they thought I wasn’t going to survive. The surgeon had to remove part of my bladder plus more of my large bowel than she intended, and my stoma would be permanent. This took the wind out my sails. Even though I had been warned that I would come out of theatre with a stoma, when it was actually there I couldn’t deal with it. Knowing that it was permanent, I turned to my wife and told her I didn’t want to go on. I was in hospital for eight days after my op. The nursing staff and the stoma nurses at the Queens Hospital, Burton on Trent were absolutely brilliant and very patient. At first, I didn’t want to change the bag but they said that I wouldn’t be allowed home until I had done it myself. When I first came home, I had a few problems: my wound became infected, I had to be readmitted to hospital on four occasions, and once had to stay in for a week. I had no problems with the bag itself, but it was a few months before I got my head round having a stoma. A good friend saw that I was in a dark place and his straight talking encouraged me to snap out of it. Then I met one of my mum’s friends who has a colostomy and sharing experiences with her finally turned things around for me. I think, when you first have a stoma it is so important to be able to talk to other people who live with one. I am still in touch with my stoma care nurses and they ask me to talk to their patients. I sometimes see them before their surgery, but I usually visit them in hospital after the operation. After they are discharged I will often keep in touch with them on the phone, by e–mail or visit them at home. Three months after my surgery, I went back to work as a garage mechanic. When I first came home from hospital I was using a drainable bag but found that quite difficult to handle. Then at an open day I came across the Welland flushable, closed bag. At work I found this so much easier: I had no problem with disposing of a full bag as the liner and contents are just flushed down the toilet. However, I didn’t feel the same about my job anymore. It was as if my priorities had changed: I was very aware that I had nearly lost my life and felt I wanted to give something back. When I told my boss that I was leaving, he tried to make me change my mind or at least stay on until I’d found another job, but I’d made up my mind, and handed in my notice the following day. Giving up my job in the garage was a good decision. I became a volunteer for Leicester Lowland Search and Rescue. We work alongside Leicester police to help find missing or vulnerable people, especially if they are children or elderly, have dementia or if they have made suicide threats. It was while I was doing this voluntary work that someone suggested that I apply for a job with the ambulance service. I now work for the NHS in the Staffordshire Ambulance Service. 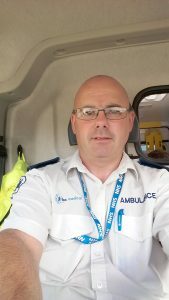 At the moment I am an ambulance care assistant (ACA) and also an advanced blue–light driver working alongside paramedics on emergency transfers to centres which provide specialist care, doing 12–hour shifts from 8am until 8pm. Everyone I work with on the ambulance knows I have a stoma so it isn’t a problem if I need to change my bag while we’re out on a call. I have, however, had some funny looks when I come out of an accessible toilet wearing my uniform! Since I told my work colleagues that I have a colostomy, they have asked what it feels like to live with a stoma. I am quite open with them and take the opportunity to pass on information. I tell ambulance crews to look out for clues that someone might have a stoma: perhaps their patient will keep touching their abdomen to check that their bag is OK. I show them the bag of supplies, ostomates will have with them when they are discharged from hospital, and suggest they take care when fastening the seat belt, so that it is not restricting the stoma or disturbing any abdominal wounds. I often wish that, when I was younger, I’d chosen a career in healthcare. I have now completed my high dependency training and am hoping I can build on this and progress in the future. My wife Cherry has been my rock through it all. I have had my share of bad days and still do, but the good far outweigh the bad now. And finally, my advice to other ostomates: don’t be afraid to talk about it – it lessens the load.